Megan and I are big proponents of using every bit of your wardrobe. San Francisco loves to be casual (often much to my disappointment) and while dressing down works most days, sometimes it means missing out on wearing some of your favorite pieces. How do you blend with the casual culture while still expressing some of your own personality? Read on for a few tips on how to take your formal pieces to daytime casual. 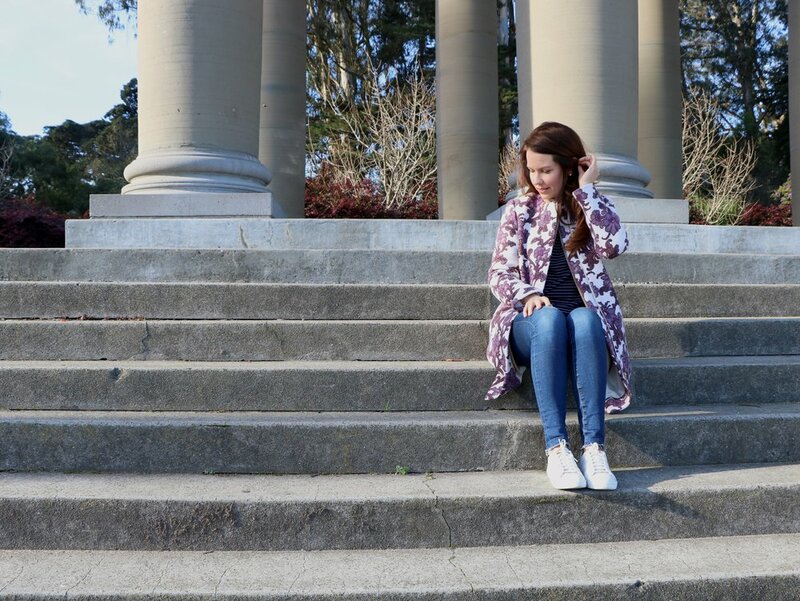 I found this floral jacket at Club Monaco last Spring and fell in love with it. When I went into the SF Club Monaco shop late this fall and found it on super clearance I texted Megan from the dressing room. It was meant to be, the last one left was in my size. The print reminds me of French wall paper and I've always wanted a winter white jacket that is easy to keep clean. The purple shade of the flowers works with my Autumn coloring and the silhouette is a modern take on a 1950's classic. The sum of the design makes the jacket a polished piece that can easily be dressed up or down. I'm a pretty analytical thinker and the way I style often reflects my time working in buying/merchandising. I like to tell clients I see their closets like assortment spreadsheets. The name of the game is how all the pieces work together. A simple rule of thumb when putting together a smart-casual ensemble is to have one key item that is more formal and pair it with softer casual pieces. In this case, I paired a formal jacket with a casual top, denim and smart shoes. To keep this look soft, spunky, and sporty I added a clean pair of off-white sneakers to balance the femininity of the jacket. Pro-Tip:The mix and match capability of an item is often directly related to its sell-ability (and value). Look for pieces that are easy to "dress up" or "dress down" before investing. 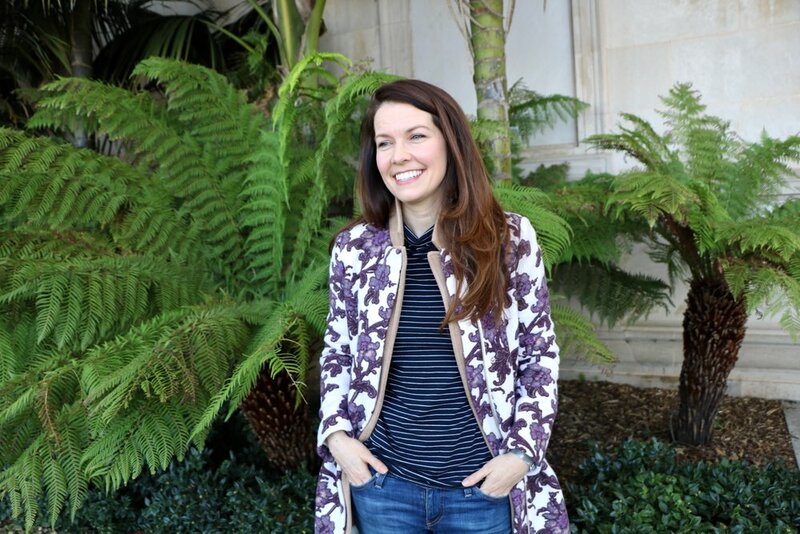 The floral print of my jacket adds a seasonal nod to impending spring, but it is bold and can quickly dominate a look. Pairing the print with neutrals looks great and elegant, but adds sophistication to an already formal jacket. To add contrast, Megan suggested trying my striped turtleneck. I bought this last year at the Gap and it has become a staple this winter because it is so easy to layer. I love the way it stands up to the print, but wanted a little more interest so added another staple layer. My camel j.crew sweater (this fall I blogged about this sweater blazer and it's finally back in stock) adds a collar to my jacket and another layer of warmth needed this time of year. I like to keep my jewelry choices pretty simple and because this jacket is loud enough already I opted to keep it cool with silver. To play off the navy and white stripe, a simple pair of pearls keeps the look clean while still feminine. I added my silver Skagen watch for an contemporary edge. The next time to open your closet, take a look and pull out that piece that doesn't get enough wear. Chances are you can wear it more often that you think! Posted on February 2, 2018 by Kimberly Gant and filed under Style Stories and tagged Florals Club Monaco JCrew Gap high low winter style.